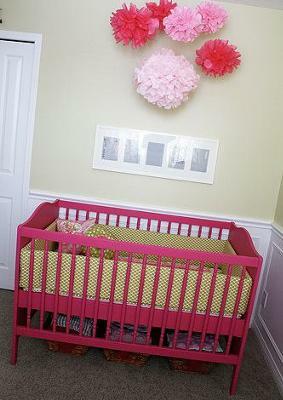 I have my baby girl's hot pink and green nursery all decorated and ready to go. I had so much fun decorating my baby's room and I'm so happy that it turned out exactly how I wanted it. From the very start I wanted the crib to be painted hot pink and thanks to my husband, that's what I got. I had used this Ikea baby crib for my first two babies. After a makeover that required four coats of hot pink paint to the wood's original finish (thanks, Sweetie)I had the crib I wanted. I didn't bother with searching for a baby mobile to match the pink and green baby bedding and just went with my tissue pom-poms. They just look so girly and fresh. I would make some and use them in the master bedroom if my husband would let me. NEW! 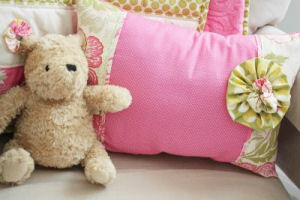 Baby Girl Nursery Themes that will look amazing in a pink and green color combinations. My mom made all of the crib bedding herself and it is just so perfect! 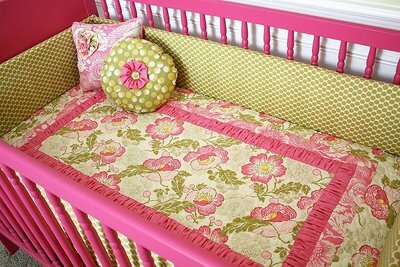 I wanted a hot pink and green nursery color scheme and after some searching this is the fabric that I found. I just love Amy Butler fabric and I believe that all the fabrics that we used in the baby's room are Amy Butler. The Amy Butler green dot fabric is one of my all time favorites; it's just so timeless and fresh! 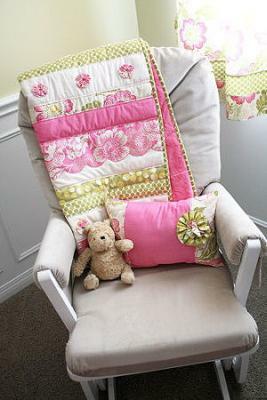 My mom also made the baby quilt and the pillow that you see in the rocking chair. And the little Pooh bear has had a special place in all three of my nurseries. My husband painted the changing table pink and I replaced the handles. I don't have a before and after picture to share but let it suffice to say that it's amazing what a little paint and new hardware can do, especially when the paint color is hot pink! I have a little Ikea lamp on top that I love because it casts a dim light that is perfect for quiet times in the rocking chair. Both the letter "K" and the clouds were hand-cut so I don't have a shopping resource. The picture frames are both Ribba frames that came from Ikea. The little wall shelves are from there as well, and are just right to hold and display our favorite books. You just can't have too much storage in a baby's room. So, I filled baskets that I decorated using hot pink tulle with clothes that the baby has yet to grow into here rather than having them in the closet and dresser drawers. 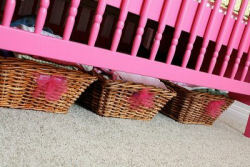 The tulle fabric decorating the baskets just makes everything cuter, right? I bought more baskets at Ikea that I use to organize all of that other random baby "stuff" that a mom needs like hair-bows, soothers, baby mitts; just all those little items that you collect. 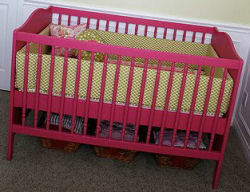 That's about all that I can think of to share about our hot pink and green nursery design! Thanks for looking and if you have any questions about any of the features, please drop me a line using the comments section provided by Unique Baby Gear Ideas for your convenience. WOW! I love the color that you painted the crib. Green and pink is one of my favorite color combinations. You did a great job in decorating this room and DIY baby bedding set is so beautiful. I am trying to paint my daughters room this color and am having trouble finding the paint color. What color did you paint this room? Please comment back! I absolutely LOVE your bedding. Would you be willing to make an sell another set?? I have been desperately trying to find something so beautiful! I love the tissue pompoms. how did you make them? 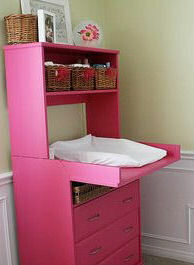 Love the room :) I especially love your changing table idea! Did you put it together or pick it up like that? What a cute nursery for a special baby! Love this baby room. It's completely perfect...every detail!